Granny knows best, my duckies. You'll behave if you know what's good for you. Granny Rotten is surrounded at all times by a thick cloud of perfume. Sweet to the point of being sickening, Granny says she wears it 'so the young lads know what they're getting into when they come a-courting'. Slow and a bit unsteady on her feet, Granny finds walking difficult without her cane which she always carries with her. While her clothes were likely never considered fashionable, she does attend to them with great care, making sure they are placed just so, and always clean and in good repair. Slightly hunched, gravely voiced, with eyes so light blue they might be white and hair that long ago lost any color, Granny Rotten is the very picture of a kindly, aged grandmother. Never you mind the writhing, squirming shadow, or how Gran's thick robes hide how her skin bunches and bulges in places, like something's wriggling underneath. It's not polite to comment on such things, duckie. The doting if strict disciplinarian of the Kovak Finishing School, Granny Rotten is every inch a granny. The safety of her little duckies is paramount, and Granny is always checking up on her charges to make sure they are doing the very best they can. While she encourages her to lead positive, moral lives, and indeed can be very judgmental of those who don't follow her conservative morals, Granny has more than one tale of the wild days of her youth, and takes a special pleasure in telling them at the worst time. Granny dislikes violence, dislikes ruckus, and dislikes people telling her what she can or can't do. Of course, it's important to understand Granny Rotten doesn't take care of her charges out of a sense of altruism or good will. She takes care of them because they are hers, and their lives reflect on her. Granny believes very strongly in the survival of the fittest, so she wants her duckies to be the fittest they can be. She and hers will take what they want, because they are strong enough to do so. Granny doesn't take well to those who falter in that pursuit, and if her charges prove to be weak, Granny is perfectly willing to whip them back into shape. Literally. Granny Rotten is shrewd, full of low cunning and animal instinct. She embraces power in whatever form it comes, and has no reservations about doing necessary, ugly things to secure it. Wicked, bawdy, prideful, and sycophantic, Granny is a hypocrite and revels in it. She does not believe in morals, in codes, in causes. Those are lies the weak use to justify their desires. Take what you want, do what you want, and make no excuses for what you are. The Shades of the Uskwood. The bogeymen that frighten even the pallid citizens of Pangolais fear. The secret order of druids, warlocks, madmen, and murderers that lurk within the shadows of the Uskwood. Sworn to the dark god Zon-Kuthon, they draw power from the putrid, violated forest they call home. Boasting their fair share of witches, the Shades may be the second largest group devoted to witchcraft in Avistan, trailing behind only the frozen mistresses of Irrisen. Their dark power has touched many lives. Ethel Rotten remembers little of her life before she came to live with the Shades. She was six, when she was taken. Was she a citizen of Nidal, or of one of the unfortunate nations to share a border with that foul nation? She does not remember. She remembers flashes of the raid. Twisted beasts rushing from the woods, ripping the throats of her siblings. Her father, desperately fighting off a woman with writhing hair and talons instead of fingernails. Her mother, trying to hide her behind a small shrine to Desna before an ogre of a man dragged her out of the farmhouse. Ethel remembers laughing, as the woman scooped her up and carried her into the night. Ethel trained with the Shades immersing herself in the dark practices of the Uskwood. She learned how to speak to the rot of the wood, to draw power from it, and learned that the rot was in fact everywhere. She learned to take it into herself, and on her twenty fifth birthday, Ethel made a pact with a spirit of that dark wood, binding herself to Zon-Kuthon and accessing her latent arcane power. Wielding two magics, Ethel served the Umbral Council as hunter and raider, capturing slaves and runaways for the glory of Nidal. She despised them all. They thought they could rule her. And, for now, they were stronger, so Ethel would bend. But she would not stop scheming. Much, much later in her life, her Shade masters gave Ethel a new assignment. A witch in Brevoy that went by the name of Madame Lucille Kovak was beginning a new venture. The Shades owed her a boon for some service years ago, and Lucille needed someone to mind the students she was gathering. The Shades would send Ethel, both to repay their debt, and to keep an eye on Lucille. When Ethel eventually arrived on the doorstep of the Kovak Finishing School, she swore her loyalty to Lucille, and joined her growing coven. Here was an opportunity to free herself from the Shades, and embark on her own journey to power. Fifteen years Ethel has been in Lucille's service, far away from her old masters. Lucille allows Ethel far more freedom, and Ethel has found she enjoys working for the blood hag. The arrangement is suitable, and their goals align. Granny Rotten, as she has come to be known, is looking forward to what comes next. Short Term: Keep the duckies safe for Madame Kovak. Secure a place for us to grow and thrive. Long Term: Immortality, in some fashion. Break the chains binding me to Nidal. Be the best monster I can be. Last edited by THEChanger; Apr 19 '19 at 7:20pm. This text describes what is happening. "This text describes what Granny is saying, duckie." This text describes what Granny is thinking, you ungrateful little brat. This text describes important mechanical information. And that's all she wrote, folks. 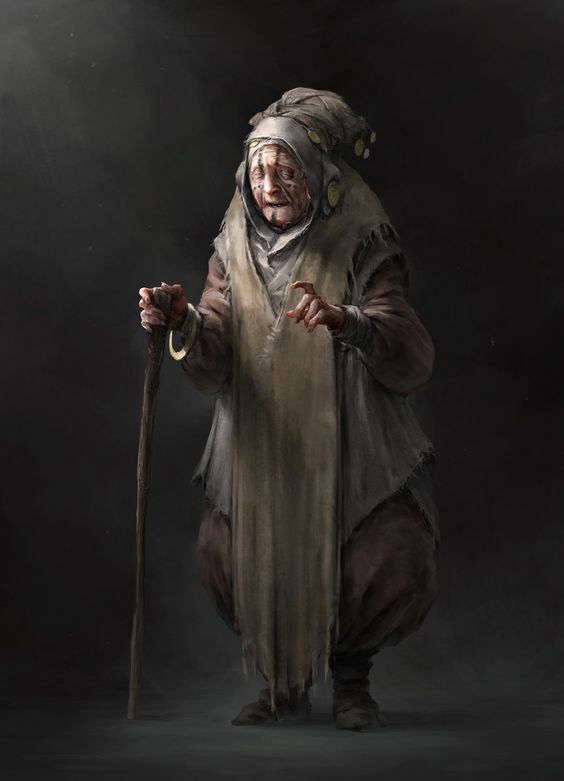 This is Granny Ethel Rotten, the cackling old minder from Kovak Finishing School who is absolutely not a swarm of rats in a trench coat dedicated to a god of pain and rot. One minor mechanical question is the interaction between Infestation of Entropy from Putrefactor Witch, and Fecund Familiar from Swarm Monger. I'd be happy if both abilities applied to a single familiar, making a super Rat. If you'd rather Granny have two familiars, I'd make the Witch Familiar a rat, and the Druid Familiar a raven. God its just really simple but I kind of love it. For some reason I have a soft spot for old adventurers and the idea of this creepy older school mistress accompanying all these youngins on the weirdest field trip ever is too entertaining to me. Overall though its a very thematic character. It might be weird to accept two Witch|Druid gestalts but Ill be damned if it doesn't just ooze flavor and I love that. As for the mechanical question I see no reason at all why they couldn't both just apply to the same creature. Your rat would be both your animal companion and your familiar.